Will Infosys revitalize the mortgage processing market with ABN Amro’s Stater, or is this merely sweating a commodity asset? Infosys has just announced a joint venture with ABN Amro for mortgage administration services, where it will acquire a 75% stake in Stater N.V., a wholly owned subsidiary of ABN AMRO Bank N.V., that offers mortgage services across the value chain including origination, servicing and collections. The transaction is valued at $143.53 million and is Salil Parekh's second acquisitive move in Europe since his appointment as CEO a year ago. Clearly, bolstering its European presence is a big deal for INFY in 2019, gaining more "zero distance" impact with European clients, adding more innovation centers, and strengthening its local footprint and brand across Europe. Has Infosys finally gone all "sensible" on us? Mortgage processing is one of the most commodotized 3rd party banking offerings, where services are heavily outsourced to offshore locations, the technology platforms are mature and robust, with a lot of focus on eliminating manual processes over the last 5-10 years. In addition, all the major banks have been signed up. So is this the new Infosys? Making moves into dependable industries in areas it knows it excels, such as BPM services. Has the firm become (dare we say it) a bit boring after several years of perpetuating an Indian soap-opera of jet-setting CEOs, highly-public power struggles and grand-standing new strategies? As with most services that are reaching maturity, incremental productivity improvements can be achieved with investments in automation, analytics and AI - and training staff to manage these enhancements. However, mortgage processing to-date has proven little more than a linear, lengthy, margin-thin business, where the winners will be those who can shuffle the market shares into their bailiwicks. So while it clearly makes sense for ABN Amro to divest of a commodity asset, what’s really in it for Infosys? Infosys has traditionally performed well in banking and financial services in the US, but has tended to lag behind the likes of Cognizant and TCS in recent years, hence this deal really helps level the global playing field among the leading India-heritage providers focus on the space. In addition, Infosys leveraged its long-standing existing footprints in ABN to beat Cognizant to a marquee European client. With CEO Salil Parekh personally involved – especially with his personal history in the banking sector - this is a particularly satisfying deal for the firm, and marks a much more ideal addition than the recent problem technology assets Pannaya and Skava, which have proven a real bane to the firm. Stater provides services to an array of mortgage lenders in the Benelux region, with its greatest depth of customers and capability in the Netherlands. Stater also brings intellectual property into the mix with its digital Stater Mortgage Platform. This deal brings a notable European expansion of Infosys’ mortgage administration services capabilities. The existing bulk of its mortgage capabilities are decidedly North America-focused. Stater’s leadership role in The Netherlands, its solid client base, and its existing digital platform are all strong assets for INFY to build on. Stater celebrated its 20th anniversary in 2017 and begun focusing on the development of its digital platform. So there is a digital baseline, but clearly the INFY play here is to drive substantial digital optimization using levers such as dynamic workflow, API layers, RPA and analytics to reinvent manual processes, improve the borrower experience and, overall, create digital operations. As INFY acquired the majority stake in the asset, it can quickly make these changes happen. ABN prefers to be the lender not the mortgage servicer, so it offloaded this non-core business to INFY. Although note ABN’s bet hedge of retaining a 25% stake in case this all goes swimmingly – and also increases the desire to co-innovate with the new partnership. There is no doubt that INFY can drive some “standard” efficiencies in this business, such as some improvements to the offshore people management, platform development and further process improvements, but mortgage servicing is a commoditized, low margin business that has been incrementally optimized, but lacks true change and innovation. It is still fundamentally laborious and slow. Hence, if INFY truly wants to meet impressive KPIs with this deal it really needs to invest in improved automation, especially with its learnings and experiences from its US clients. The latest mega deals in the IT and business process services market are all about buying a big book of business and using an arsenal of digital tricks to run it leaner and more efficiently. Recent business services examples include HCL’s $1.3 billion shared “services deal” with Xerox and Wipro’s $1.5 billion deal with Alight for health, wealth, HR and finance solutions. While INFY’s ABN deal looks more like a traditional acquisition than an outsourcing mega-deal, it is still premised on the unifying theme that human-only labor arbitrage-based business models are now hygiene. The new gig is driving enhanced value through better process automation, analytics, better staff development and hybrid workforces. 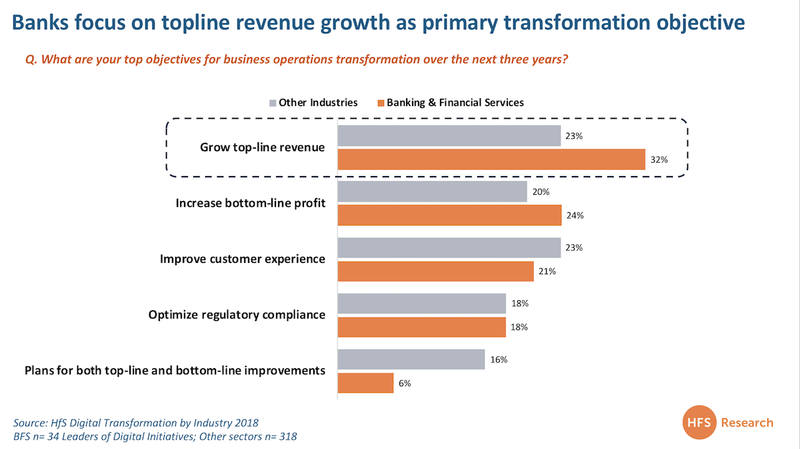 Driving growth is the leading transformation objective for large banks (see Exhibit 1). They are shedding non-core assets to enable pivot to digital growth. More than a decade after the global financial crisis, profit and revenue performance of global banks is anemic. Firms are divesting-non-core assets to better enable focus and generate funds to support investments in digital business transformation – often using divestments to streamline operating models so they can pivot more quickly toward growth opportunities. Recent examples include Thomson Reuters sale of a 55% interest in its Financial and Risk company to Blackstone for $17B, now rebranded the unit as Refinitiv, Barclay’s disposal of certain AP-based wealth management businesses, and UBS’ sales of its Dutch wealth management business. Bottom line: Infosys gets scale and market share but needs to re-invent the tired mortgage servicing market to make the Stater acquisition truly notable. If Infosys really wants to make this mortgage play differentiating, it will need to refocus seriously its efforts around borrower experiences across the lifecycle of originations, servicing, and collections. In a commoditized mortgage market, change has been slow to come in the form of “e-mortgage”. Infosys must use this opportunity to go beyond driving cost efficiencies across Stater’s operations and platform with its automation toolbox. It must use its design capabilities to rethink engagement strategies for borrowers, and ultimately configuring the digital components that link these activities back to its platform and clients’ core systems. The more Infosys can simplify the complex and often harrowing mortgage process for borrowers, the better its chances for seeing ROI on this deal.